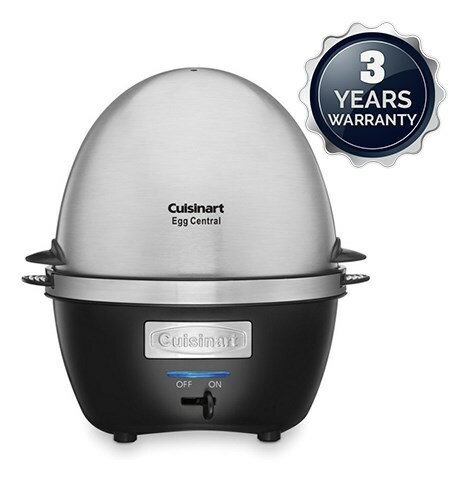 The Cuisinart CEC-10 is a egg cooker that has a new two-tiered cooking system which prepares up to ten soft, medium or hard-boiled eggs. This cooker has removable trays that can be used to poach eggs and make omelets and cooking time can be controlled by the amount of water added. It features built-in LED light, audible alert, and standby mode help guard against overcooking. The 10-Egg Cooker has many exciting features for users of all types. 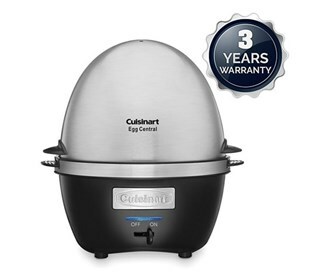 You can extend the lifetime of your 10-Egg Cooker with the purchase of a FactoryOutletStore Factory Protection Plan. See the 10-Egg Cooker gallery images above for more product views. The 10-Egg Cooker is sold as a Brand New Unopened Item.